The whole thing started out in December 2014, when Julian Winter had discovered Fire to the Stars’ remix of Monolog’s Another Day. Julian immediately asked if he could have a multi-track version of the track from Fire to the Stars front man Tim Spelman, which Tim, as always, was happy to provide. Whilst Julian was working on his version of the Another Day remix / Made of Fire, Tim thought it would be a cool idea to return the favour by going all the way with a remix if Julian’s track LA, even arranging a real cello quartet for the string section. When both remixes came back to us, we were quite overwhelmed with the result, and saw no other option than to release both tracks as part of a larger Humanworkshop remix EP. Hence Metamorph was born. Leisure-B decided it would be a good idea to pick up two remixes at the same time. He rearranged and pimped up Julian Winter’s Dour, from his album Slow Movement, while at the same time having a go at drum and bassing up Remus’ classical track Herr Obersturmbahnführer, which is available on his VERZET OST ep. Gritt also joined the party, picking Monolog’s Beautifull as a proper candidate to release his remix furies upon, ripping the track open while providing her smooth and amazingly danceable characteristics. Monolog on their part had a go of creating a Japanese dance version of Fire to the Stars’ Starting with M. The whole thing is finished of nicely by Humanworkshop freshman Caveone, who couldn’t keep his hands from doing a gritty neurobass remix of Fire to the Stars’ Keep You Safe, setting the remix count of this track on our label to two. After enjoying a beer with Leisure, EQUILOUD got creative and in a moment of devine inspiration came up with the artwork for the EP, providing her with a classical yet modern feel. 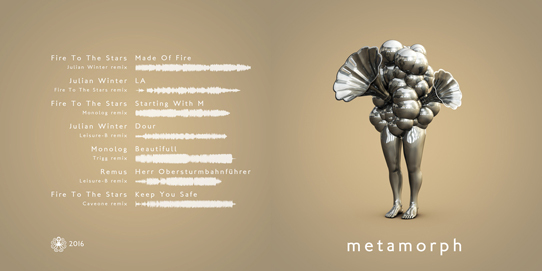 The result of this huge international logistical opreation and the creative forces which it has unleashed, is the brand spanking new Humanworkshop EP Metamorph, a great joy for your ears, the attached neuro receptors and the mind which they feed into. Go get it while it’s hot!